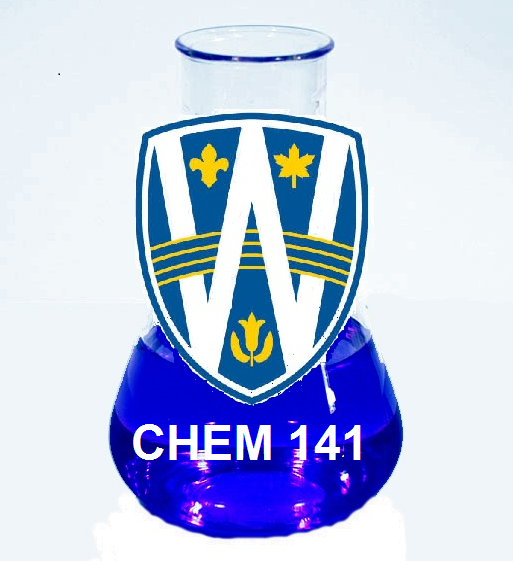 ​This course looks at the behaviour of compounds in solution. We examine chemical reactions in terms of reaction rates (kinetics) and equilibria (thermodynamics) in order to answer fundamental chemical questions like "how fast?" and "how far?". We apply these methods to understand acids and bases and introduce the pH and pKa scales as measures of acidity and basicity. We conclude with a study of electrochemistry in which we look at chemical reactions which involve electron transfer. Course Text: Chapters 12 - 18 of "Chemistry a Molecular Approach", Nivaldo Tro. Lectures are typically students’ first engagement with topics in Chemistry. A well-presented and coherent set of lectures can inspire students and stimulate their interest. I try to offer a lecture series which raises interest and engages students with a discipline which I feel passionate about. It is easy to get lost in the detail and I try to place chemistry within the context of real-world examples in order for students to see the application of course material in everyday life. 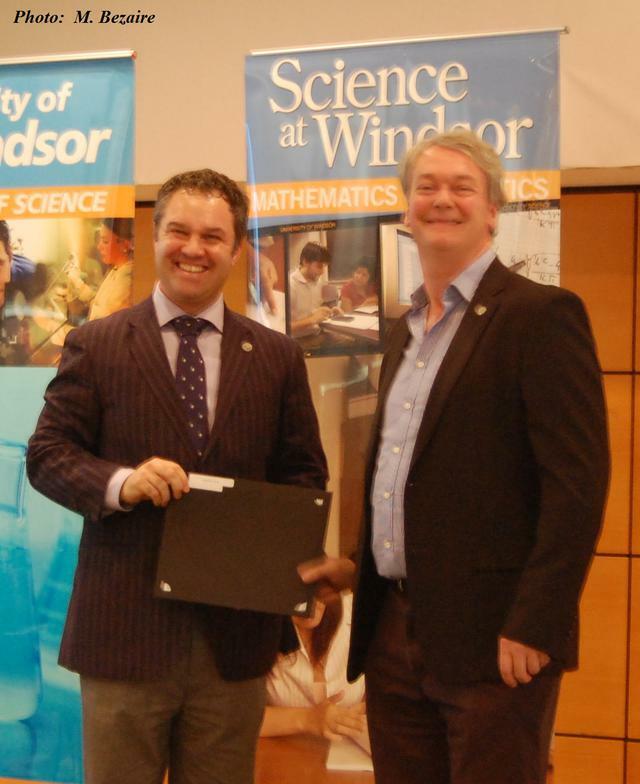 Dr Rawson is featured (right) receiving the Roger Thibert Award from Acting Dean of Science Dr C. Macdonald. Free radicals play an important role in everyday life. We examine how free radicals are generated and the factors affecting radical stability. We examine EPR spectroscopy as a primary technique for characterising free radicals and mapping the spin distribution and extracting information on coordination geometry for S = 1/2 metal complexes. We conclude with a survey of free radical reactions in organic chemistry and draw parallels to biological systems, exemplified by lignin synthesis, lipid per-oxidations and vitamin B12 chemistry exemplified by dehydrase and mutase transformations. Probably more than you ever wanted to know about magnetism! This course starts off from the basic origins of magnetic moments (spin and orbital angular momentum and spin orbit coupling) to magnetic communication pathways (direct exchange and superexchange processes) within clusters and extended networks. We examine qualitative estimates of the strength of the exchange interaction (J) through Curie-Weiss Law and use Quantum Mechanics to solve the spin Hamiltonian in order to determine expressions to quantitatively estimate J for small high-symmetry clusters. We examine unusual quantum magnetic behaviour in discrete molecular systems known as single molecule magnets. We conclude with an analysis of the different types of long range order possible, focussing on ferromagnetism, antiferromagnetism, ferrimagnetism and canted antiferromagnetism. We examine different magnetic measurements to discriminate between these magnetic phases. "He's honestly so friendly and really explains concepts well. By far one of my favourite teachers.... and I don't even like Chemistry that much"
"I really liked this Professor. I really can only say good things. His enthusiasm is very great and he seems to really want his students to succeed. I am actually sad this course is coming to an end." "The best course I have taken in all of my 4 years at the University. Course material presented in an organized fashion. Excellent instructor." "Rawson is the bomb :-) Best professor I’ve had all year!" "Dr Rawson is by far one of the best Profs I've ever had. Exceptionally dedicated, organised and hard-working. There isn't a single thing he could do better!" 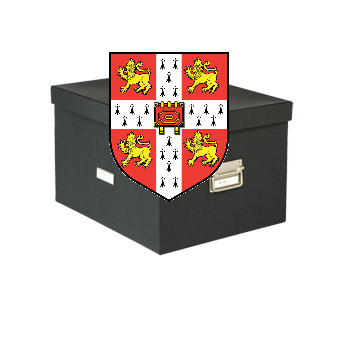 You can find copies of lecture material, additional notes and exercises from courses previously taught at Cambridge including main group chemistry, coordination chemistry, organometallic chemistry, lanthanide chemistry and magnetism. "[The course material] was sometimes hard to understand but with the provided material and solved exercises it became easier. A very useful course and it really enhanced my radical background"